As cold weather approaches, horse owners need to prepare for the dietary changes often associated with feeding horses in the winter. Horses have a thermal neutral zone with upper and lower critical limits; anything outside of these values can cause thermal stress. For a mature horse in good health that has had the chance to acclimate to the climate, the lower critical limit is 10°F and the upper critical limit is 90°F. A horse will have little difficulty maintaining body temperature within this range. Youngsters, seniors and horses with health issues have different lower critical temperatures (LCT). For example, the LCT for a yearling acclimated to cold weather is about 30°F. When a horse is at or below his lower critical temperature, the heat generated in the digestive system, and through shivering and exercise, can help maintain body temperature. Thin, young, senior or horses with short hair coats (body clipped) have increased energy requirements. Wind, rain, snow and mud also increase a horse’s energy requirement over that needed for maintenance. Wind chill can have a profound effect on energy requirements, considering ambient temperature can drop 1°F to 3°F as wind speed increases. The digestible energy (DE) requirement for an average 1,100 lb horse is 16 Mega calories/day; however, the DE requirement increases 2% for each 1°F drop below the lower critical temperature. For a horse in an environmental temperature of 40°F, standing in the rain with a wet hair coat, his energy requirement jumps up to about 22 Mcal/day or slightly more than the same needs for a horse under light work. A horse’s energy requirement is significantly affected by temperature. One way to boost the energy intake during the winter is simply to feed more feed; however, the increase should come from supplemental forage intake. Increasing the forage portion of the diet is safer than increasing the grain portion; it does not amplify the risk of grain overload founder or colic. Fiber digestion (fermentation) in the cecum and large intestine increases the heat production of a feedstuff. 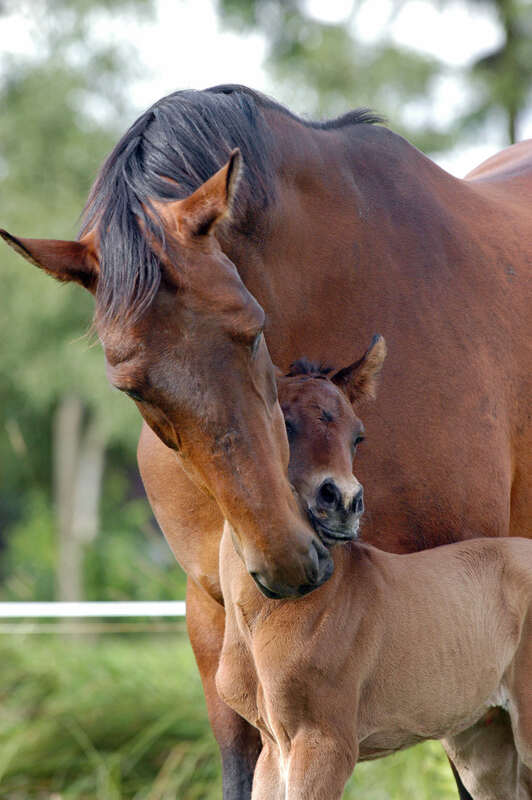 This increased heat production, or heat of digestion, can be used by the horse to help maintain body temperature. If the horse’s Body Condition Score (BCS) decreases, then grain or an energy-dense supplement should be added to the diet, or increased if it’s already being fed. Add or increase grain intake slowly to minimize the possibility of digestive problems. Water is also very important in helping the horse maintain body temperature. If water intake decreases, feed intake will also decrease, causing a reduction in digestive heat. Another result of reduced water intake is a higher incidence of impaction problems; more horses are treated for impaction in the winter months than summer. A decrease in water temperature does not usually affect water intake unless the horse has tooth problems. Some management practices that can be done to maintain water include keeping ice broken in the bucket or trough, and adding loose salt, a salt/calcium/phosphorous trace mineral mixture or a good quality electrolyte such as Horse Health™ Electro Dex® electrolytes to the horse’s grain (if grain is being fed). Salt blocks or bricks are not acceptable alternatives, as providing the horse with loose salt will encourage a more consistent consumption. 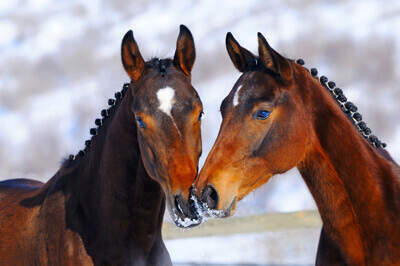 Horse owners who understand how cold weather affects the dietary needs of a horse, combined with daily observation and good management practices, can ensure that their horse(s) are adequately prepared to get through the winter months with ease. Appreciation is expressed to Robert Coleman, Ph.D., PAS, Dipl. ACAS-Nutrition at the University of Kentucky for his help in the preparation of this paper.